Palestinian refugees suffered human rights violations at the checkpoint erected at the entrance to Khan Danoun refugee camp in Damascus at hands of the Syrian regime forces, the Action Group for Palestinian Refugees in Syria said Friday. Unnamed eyewitness affirmed that Palestinian women and girls are regularly subjected to sexual harassment, intimidation and even violence at the Syrian regime checkpoint. Food aid supplies have been also stolen at the checkpoint at hands of the Syrian regime forces, he added. All these violations are carried out in presence of Palestinian fighters affiliated to the Popular Front for the Liberation of Palestine General Command (PFLP-GC) who made no reaction to protect women while passing the checkpoint. In Yarmouk refugee camp, sporadic clashes erupted Thursday between ISIS and Nusra Front fighters on the first hand and Ahrar al-Sham fighters on the other hand who managed to restore control over some parts of the refugee camp. ISIS and Nusra fighters have attacked the Syrian army and PFLP-GC fighters stationed at the entrance to the camp. Several injuries were reported among PFLP-GC fighters, media sources reported. The camp's residents have been suffering from very poor and difficult living conditions due to siege imposed by the Syrian regime for 679 consecutive days. The situation has been dramatically worsened following ISIS's savage attack on the camp in early April. Meanwhile, PLO delegation had met Wednesday a number of Syrian officials and representatives of Palestinian factions to discuss ways to alleviate the suffering of Palestinian refugees besieged in the Yarmouk especially after ISIS's attack. Opening safe humanitarian corridors and prisoners' file were the main issues discussed during the meeting, the Action Group said. 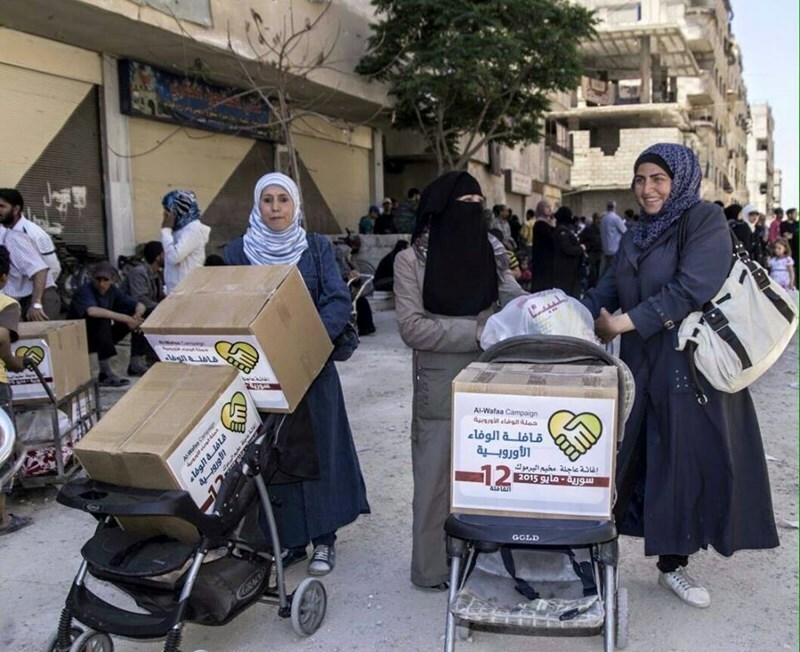 The 12th Al Wafaa European Campaign distributed relief aids to the displaced people of the Yarmouk camp for Palestinian refugees in war-torn Syria. The campaign said in a press statement Thursday it has been able to distribute some 2,000 food rations in addition to bread, milk, water, and dates during the past couple of days. The aid distribution was carried out in cooperation with volunteers from five European countries, who closely inspected the tragedy rocking the Yarmouk camp and have kept tabs on the agony endured by Palestinian refugees. Approximately 65 Palestinian refugees were killed during April due to the ongoing conflict in Syria, Action Group for Palestinian Refugees in Syria revealed Tuesday. 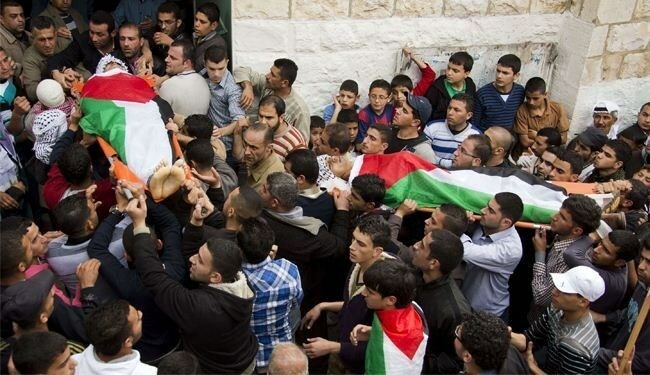 AGPRS reported that 65 Palestinians were killed in Syria last month, 32 of whom were shot dead during armed clashes, while nine others died during the continued bombing over Palestinian refugee camps, and nine victims were tortured to death in the regime prisons. 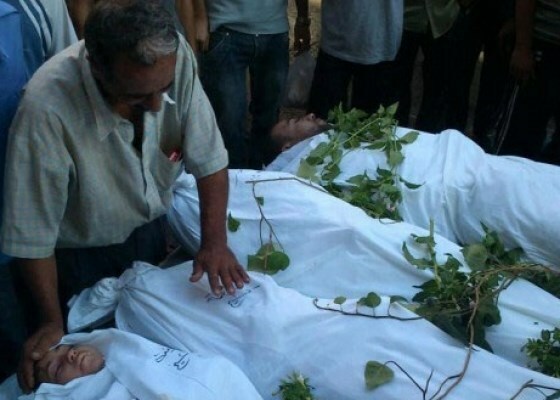 Three others of the reported victims starved to death due to the tight siege imposed on Yarmouk Camp for more than two years, while two other Palestinians were killed after being kidnapped. According to the human rights report, three Palestinian refugees were found dead of unknown reasons, while another one died after a boat carrying illegal immigrant sank on its way to Europe. UN envoy to Syria Staffan de Mistura on Monday provided the Security Council with a briefing on the humanitarian situation in al-Yarmouk refugee camp in Damascus. Current president of the Security Council Raimonda Murmokaite told a news conference yesterday that the council members listened to a statement by de Mistura on the situation in al-Yarmouk camp. Murmokaite stated that the members had confirmed their rejection of the use of cluster bombs by the Syrian regime and called for immediate ending to all attacks and violence in al-Yarmouk camp. She stressed that the Security Council would push for the achievement of a clear accountability process regarding the situation in Syria and the establishment of safe corridors to allow the civilians to leave al-Yarmouk camp and provide those who want to stay with humanitarian aid. The United Nations relief agency, UNRWA, has called on the Syrian government to refrain from targeting the Yarmouk camp for Palestinian refugees with explosive weapons. UNRWA said in a press statement afternoon Saturday it is increasingly alarmed about the safety of civilians in Yarmouk, amid reports of armed clashes, the use of heavy weapons and air strikes. “Civilians in the camp went through a night of extreme trauma and distress,” said the agency, calling on Syrian authorities to refrain from using explosive weapons in populated areas. UNRWA said it will closely monitor reports of civilian fatalities and casualties. Since the upsurge of violence following the entry of particular armed groups into Yarmouk on 1 April, civilians have faced increased threats and trauma on a large scale. Thousands have fled the camp and escalating violence to neighboring areas of Damascus where UNRWA teams have been providing critical humanitarian assistance to them. UNRWA has repeatedly expressed strong concern for the security of civilians and has demanded access to those civilians, both Palestinian refugees and displaced Syrians, who remain inside Yarmouk. “We again demand that all armed actors protect civilians in accordance with their obligations under international law and we urge all those with influence over the relevant parties, including armed groups in the camp, to demand that they fully comply with their obligations in relation to the protection of all civilians,” declared the agency. Thousands of Palestinian refugees have been trapped and others killed inside the Yarmouk camp besieged by regime army forces since the outbreak of the Syrian conflict in 2011. The situation has gone from bad to worse ever since Daesh terrorists, ISIS, took over the camp in early April. 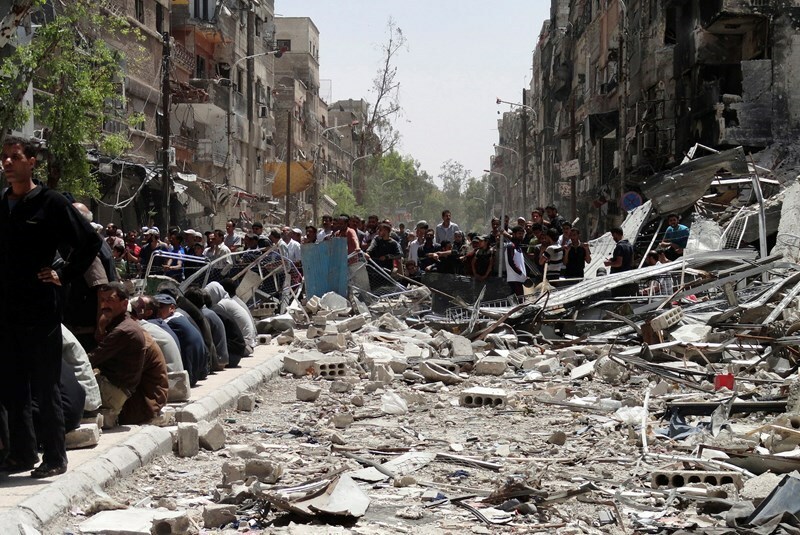 The Syrian regime warplanes dropped overnight nine barrel bombs on Yarmouk refugee camp to the south of Damascus. 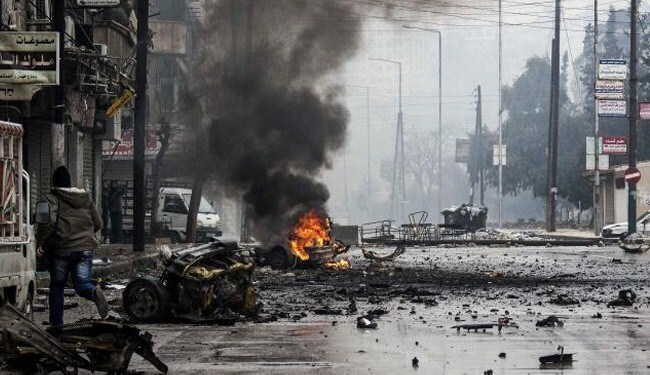 Anadolu News Agency quoted local activist Abu Obeida as saying that nine barrel bombs were dropped on Yarmouk camp amid intensive fire of mortar shells. Heavy property damage was reported. No casualties were reported, Abu Obeida added. The local activist pointed to the very poor humanitarian situation in the refugee camp due to the shortage of aid supplies and medical equipment. On the other hand, a Palestinian young man died on Friday of injuries he sustained during a similar bombing targeting the Yarmouk camp. A Palestinian woman was also tortured to death as she was detained two years ago in the Syrian regime’s prisons, the Syrian center for Human Rights said. Approximately 18,000 Palestinian refugees were besieged in the camp before hundreds of them fled to the neighboring towns following ISIS's savage attack on the camp in early April. The remaining residents have been suffering from very poor and difficult living conditions due to siege imposed by the Syrian regime. Yarmouk has been under siege for 671 consecutive days, power outages for more than 741 days, and water outages for 231 consecutive days. The besieged Palestinian refugees in Yarmouk camp launched distress calls on Tuesday to end the continued arbitrary shelling by the Syrian regime’s warplanes, the Action Group for Palestinian Refugees in Syria (AGPS) said on Wednesday. 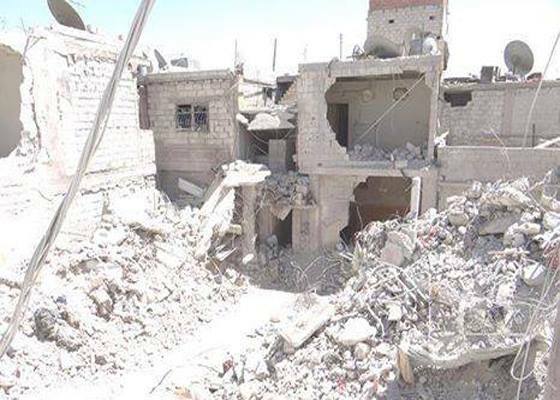 The residents of Yarmouk appealed to the UN and the Palestinian and International organizations to intervene in order to stop the heavy shelling after 14 new explosive barrels targeted different parts of the camp, the AGPS added. The AGPS correspondent reported that the Yarmouk camp has witnessed on Tuesday the most violent shelling, while local activists accused the Syrian regime of practicing scorched earth policy. The group correspondent described the situation as catastrophic in light of the accurate shortage of medical equipment due to the siege imposed by the Syrian Army for more than two years. Approximately 18,000 Palestinian refugees were besieged in the camp before hundreds of them fled to the neighboring towns following ISIS's break-in into the camp in early April. The remaining residents have been suffering from very poor and difficult living conditions due to the imposed siege for 671 consecutive days, power outages for more than 741 days, and water outages for 231 consecutive days. The number of victims in the camp had reached 176. Three Palestinian refugees were killed Monday due to the continued bombing and ongoing clashes in the vicinity of the Palestinian refugee camps in Syria, rights groups said. 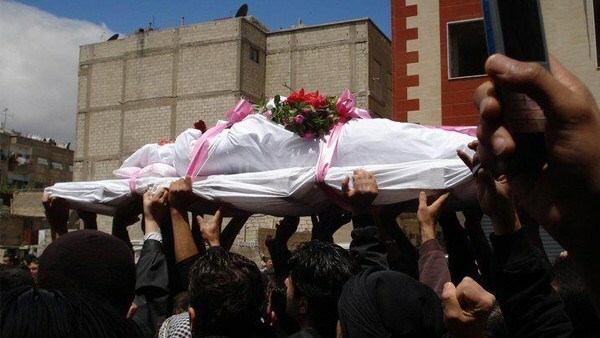 The Action Group for Palestinian Refugees in Syria (AGPS) said in a written statement issued Tuesday that the three victims were identified as: the young man Mohammed Jamal Mawed who died due to the ongoing conflict in Syria, Abu Louay Saadeia who was tortured to death in the Syrian Regime prisons, and the Palestinian female refugee Amna Hussein Amayri who died due to lack of nutrition and lack of medical care in Yarmouk. Meanwhile, the AGPS documentation and monitoring team indicated that 176 people from Yarmouk died due to siege and lack of medical care. 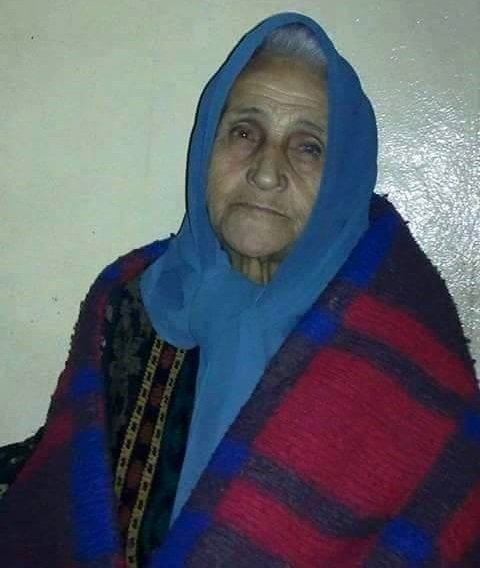 Another Palestinian lady breathed her last at the blockaded Yarmouk camp for Palestinian refugees in war-battered Syria due to malnutrition and lack of medical care. The Action Group of Palestinians in Syria said in a statement the refugee Amna Hussein Omri died of famine and dehydration at the Yarmouk camp, blockaded by Syrian regime forces for 670 uninterrupted days. Amna’s demise brings the death toll of Palestinian refugees killed by medical negligence and starvation to at least 176 at Yarmouk camp alone, where over 12,000 more refugees have been deprived of nourishment, safe access to water, and urgent medical assistance. Meanwhile, member of the Executive Committee of the Palestine Liberation Organization (PLO) Qays Abdul Karim said Monday’s projected visit to Damascus to seek ways-out of the Yarmouk crisis has been delayed at the request of the Syrian government. Palestinian sources said the Syrian Foreign Ministry apologized for not being able to receive the Palestinian delegation which was commissioned to fly to Damascus to follow up on the Yarmouk refugee camp crisis. The sources said the Syrian apology came because of the confusion and position of PLO leadership on the way to deal with the crisis. However, speaking on behalf of the delegation, Abdulkarim denied any confusion in the position adopted by the Palestinian delegation as regards the crisis. He said the PLO would not be drawn into military action in the embattled Palestinian refugee camp, rejecting claims that Palestinians would join Syrian troops in ousting "Daesh terrorists". The PLO statement contradicted comments earlier by member of the PLO executive board, Ahmad Majdalani, that Palestinian groups are ready to join forces with the Syrian government to expel Daesh fighters from the Yarmouk camp. The incongruous comments by the PLO representatives exposed internal disagreements and doubts as regards the organization’s position vis-à-vis the growing crisis in Yarmouk, where thousands of trapped civilian refugees are trapped under appalling conditions. Syrian refugee Fares al-Bashawat with his 10-year-old son Nemr. Syrian refugee Fares al-Bashawat knows his two daughters may drown trying to cross the Mediterranean to Europe. But he says leaving them behind would be an even worse fate. His wife and two other daughters already reached Italy by boat, days after a shipwreck killed hundreds of other migrants.Bashawat, who says he was shot and tortured in Syria before the family escaped to Egypt, is planning to send two more of his children from the port city of Alexandria. "I'd rather my daughters have an honorable death on the high seas than leave them behind," he says.Bashawat shows his 10-year-old son Nemr a photograph of the boy's mother and two of his sisters dining out in a restaurant in Italy. They survived a voyage that many hundreds did not. Last Sunday, at least 700 people drowned off the Libyan coast in the Mediterranean Sea's worst migrant disaster. "At first I was against this kind of voyage, but there was no other option," explains Bashawat, 55, who says his family owned a restaurant chain and a resort in Syria. Last weekend's disaster triggered crisis talks in Brussels on Thursday, at which EU leaders agreed to triple the funding for search and rescue operations. The tragedy has not deterred Bashawat and hundreds of refugees and potential migrants from taking the risk.He hopes his son Nemr will be eligible for the UN High Commissioner for Refugees reunion program. His two daughters still in Egypt, both adults, are not.Bashawat says his family lived in a two-story villa near Damascus but he no longer has money "even to buy medicines." He shows scars on his stomach where he says he was shot by "a Shiite militia" in Syria. Human rights activists say refugees such as Bashawat use intermediaries to contact smugglers who transport them on decrepit boats towards Europe.One such intermediary, Abu Barra, says he secured free seats for his wife and four children to Italy last year after enlisting 10 refugees who traveled on the same vessel, each paying $2,200. "I tried to leave with my family 11 times but failed, and I was detained twice," Abu Barra says. He encountered a contractor who suggested that he recruit 10 migrants who wanted to travel illegally to Europe -- in return for free seats for his wife and children. 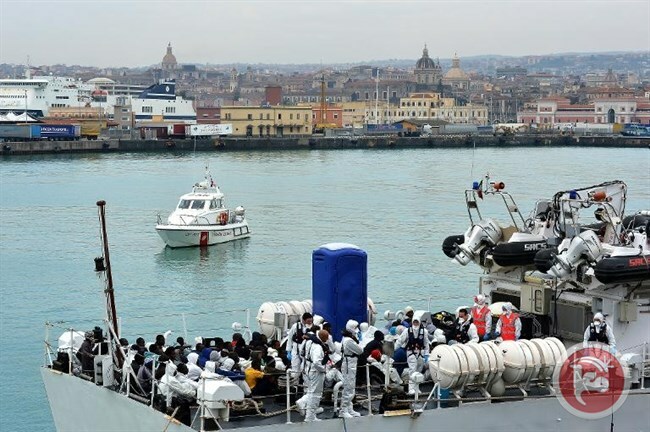 "I got them 10 people and sent my family with them," says Abu Barra, adding that the group was first taken from Alexandria on a small boat to another vessel and finally loaded onto a larger ship that dropped them off near the Italian coast." The final drop-off is usually done by those who want to fish in international waters. They take groups of 300 people or so and make the journey once a fortnight. "Activists allege that Abu Barra has himself become a "contractor," something the 40-year-old Syrian denies, insisting that he wants only to be united with his family.Smugglers use contractors who are reached through social networks on the Internet such as Facebook under fictitious names like "El-Captain" and "El-Doctor." Activist Ahmad El-Chazli of the Egyptian Initiative of Personal Rights group says that as summer arrives, more migrants are expected to try to cross the Mediterranean from Egypt. The UNHCR says around 219,000 people crossed the Mediterranean and 3,500 died in 2014, and so far in 2015 more than 35,000 asylum seekers and migrants have reached southern Europe. Chazli says migrants are increasingly working with Syrian contractors whom they trust because of "their experience, better networks and ability to reach the destination. "Bashawat sees the dangerous sea route as the way for his 17-strong family scattered across Syria, Egypt and Europe to be together again. "Our dream is to be united again under one roof," he says in his rented apartment as Nemr looks at the picture of his mother and sisters in their new life. A documentary report of the Action Group for Palestinians of Syria disclosed that 2771 Palestinian refugees in Syria were killed from the beginning of the conflict until the end of March, 2015. The report stated that 1800 Palestinians were killed in 12 refugee camps in Syria in addition to those who were killed outside of their camps in different cities in Syria and abroad. The report pointed out that the martyrs died due to direct and indirect reasons of the conflict. The direct ones are bombardment, clashes, torture in prisons, and siege. Indirect reasons include drowning while trying to reach Europe via what have been known as “death boats”. The report also documented 73 Palestinian victims who died under torture since last March. The victims were recognized by leaked photos and a testimonial of a man released from the Syrian regime’s jails. 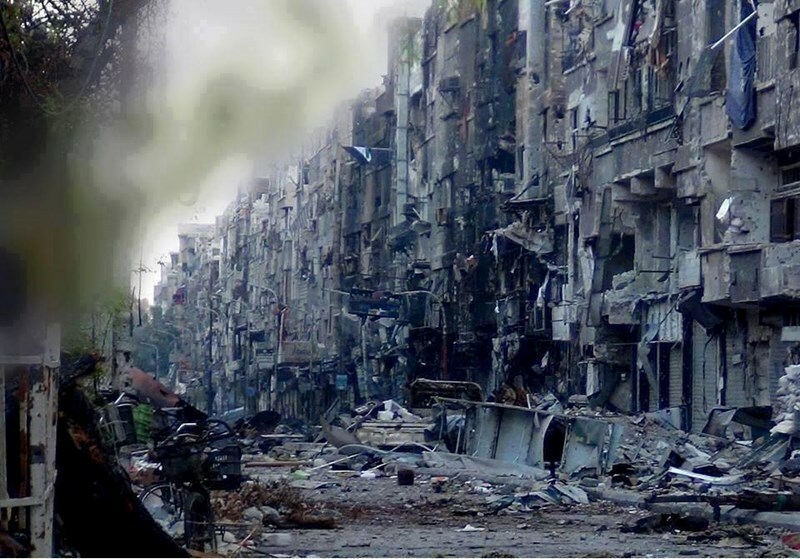 A Palestine Liberation Organization (PLO) delegation will be sent to Syria next Monday to discuss the crisis in Yarmouk refugee camp after it came under attack by the Islamic State fighters, a PLO executive committee member said Thursday. During a solidarity vigil with Yarmouk camp, the PLO executive committee member Wassel Abu Yusuf stressed the Palestinian neutral position towards the events occurring in any Arab state and in Syria in particular. "We are working together to spare the blood of our people and to protect their right of return that could never be a subject to any statute of limitations," he said. A PLO delegation will head to Syria on Monday to meet with Syrian officials in a new bid to end the crisis in Yarmouk refugee camp and to provide protection for its residents, he explained. 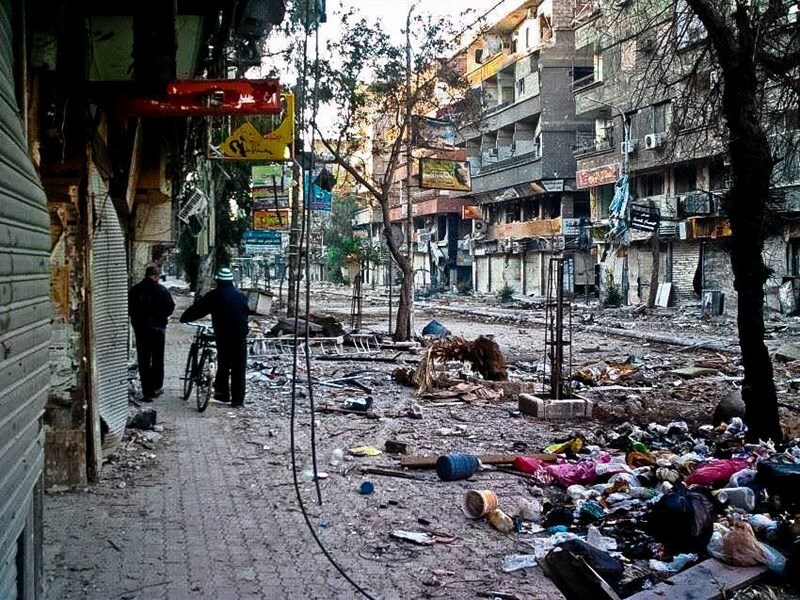 On April 1, IS fighters attacked Yarmouk refugee camp and subsequently took over up to 90 percent of the camp. Since then, armed clashes between Palestinian factions and IS fighters have been ongoing in the camp amid heavy bombing by Syria's air force. Activists said that the difficult humanitarian situation in the camp has been seriously worsened due to the ongoing clashes and the continued siege imposed on the camp for more than two years.